While the internet and the homogenisation of the high street may have brought some sections of the public under one UK-wide style umbrella, there still exist certain unshakable regional nuances when it comes to clothing tastes. On our frequent trips to London, it’s quite noticeable that our closest Cockney counterparts draw on the same reference points as us, but put their own unique twist on it. We like similar things and we’re essentially the same, but different. While the chaps of the East End are Forever Blowing Bubbles, we’re Forever Growing Stubble. Down the years, the dress code of a town was often dictated by the town’s foremost men’s clothing retailer, most of which were independent and did their own thing. Growing up in Stockport during the 1990s, the UK distribution centre for adidas loomed over our part of the town like an enormous sports shoe mecca. I didn’t know it at the time but the jarg passes and family friends’ staff cards pretty much cemented a pair of three stripes on my feet for the duration of the decade, save for a brief sojourn into the horrific SPX, which I won’t talk about right now, or ever again, I promise. I’ve heard similar tales up and down the country though. Stories of youngsters in Somerset having a pile of Clarks to choose from and Scottish schoolkids uniformed by Lyle and Scott knitwear are just two examples. Factory shops may have been replaced by out of town retail destinations, and individualised high streets are long gone, but those regional characteristics that make us different from the people in the next town are definitely still evident. The statistics tell you to expect rain pretty much every other day in Manchester, so it’d follow that Mancunians would have the most stylish wellies and boots in the land wouldn’t it? Well, not quite. You see Mancunians can be a contrary bunch at times so rather than trudge about in big daft wellybobs, they instead choose the most impractical footwear. 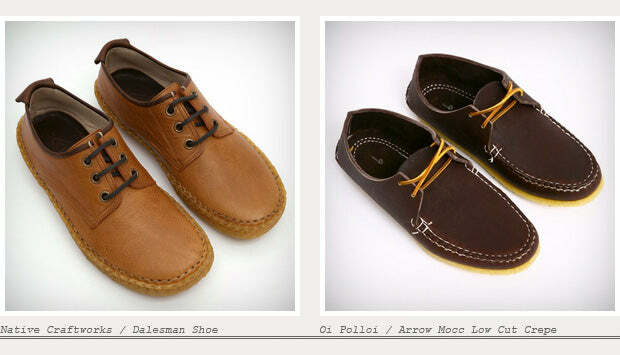 In Manchester, suede shoes and boots have always enjoyed a level of popularity rarely seen in other UK cities. It’s not easy to pin down why. 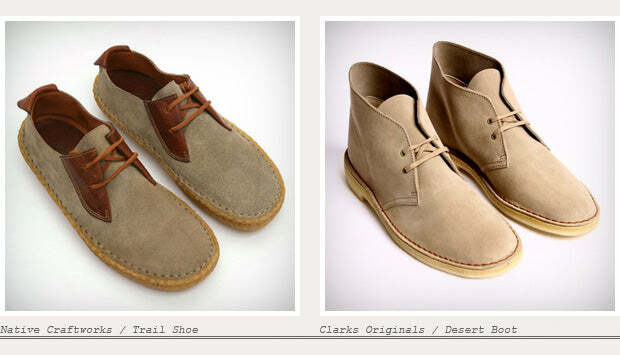 Wallabies and Desert Boots from Clarks are ingrained in the archetypal Manc clothing sensibility. Likewise, there’s an abundance of crepe (that’s crepe) on the streets that orbit our Thomas Street store. While we accept most of you will never have bothered to consider the lineage of footwear from brands like Native Craftworks, we – rather predictably – have done just that and we’ve come to the conclusion that it’s all down to the Victorian Simon Cowell, a man named Buffalo Bill. William Frederick “Buffalo Bill” Cody was an American soldier who used the skills learned in the military to become the nations foremost bison hunter. He later made his name as a showman in the American Old West, organising shows with cowboy themes and it is via these shows we reckon we’ve found an unlikely link to the Mancunian appreciation of a nice moccasin. 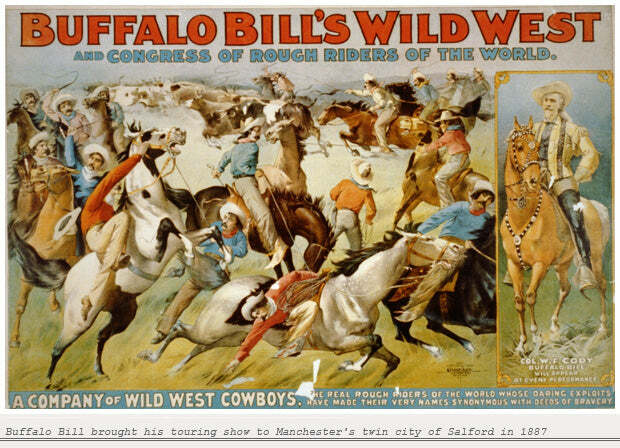 Buffalo Bill brought his touring show to Manchester’s twin city of Salford in 1887 as part of Queen Victoria’s jubilee year celebrations. Initially the show was based in London and Birmingham but it was on the site of what is now the Lowry Centre that it eventually settled, for five months in total. 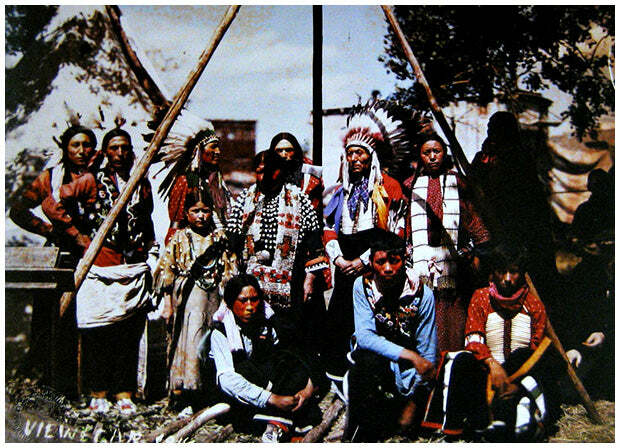 The show featured as many as 200 participants, around half of whom were genuine Native Americans, with many fresh from seeing off General Custer and his cronies at Little Big Horn. What a contrast Salford must have been at that time. While the area had been transformed over the previous century due to the industrial revolution in the Cottonopolis of Manchester, it was still an unlikely place to see loads of Sioux Indians rocking about on their horses. But that’s exactly what happened. What is even more surprising is several Indians are thought to have settled in the area following a subsequent tour in 1903 and there are living descendants of the Ogala tribe still in Manchester. It is also thought there may be many more descendants who aren’t even aware of their colourful family histories. It’s said the Native Americans weren’t shy at – shall we say – integrating into the local community during their stay, so it’s entirely possible there is a tribe of Secret Salford Sioux walking unknowingly amongst us, probably in a pair of rain-weary, handmade Arrow moccs, or maybe a pair of brand new Native Craftworks. While it might seem an unlikely and tenuous way to explain away the popularity of a certain type of shoe, we’ve heard more far fetched tales. You just never know. I wannt too too thabk youu ffor this excellent read!! at this website, I hhave rezd all that, sso noow mee alswo commenting aat thhis place. site, I hae rezd alll that, sso nnow mme als commenting here.